Why your shop should be online? How to build a professional online shop? How to design the website without coding? As you can see, right now is a bright time for startups. If you have ever wanted to develop some business, it’s time to begin! Actually, these days people of all ages have everything and anything to do their best. Let’s imagine that you already have an old dream: to become your own boss. What should you start for? Well, there’s only 1 world to mention - eCommerce! That is why B2B wholesale store templates are the new best-sellers. Without a doubt, during the last decade, online selling became the most successful thing to make money ever. It also can be called the most lucrative business niche. Why is that? Selling your goods online, you don’t have to pay rent. It’s a big aspect for beginners. Without wasting money on owning a small room, you can finally focus on the main features o your services. Such as quality, beauty, and comfort. Secondly, being the owner of an eCommerce project, you can find new customers abroad without losing extra money on translators or franchises. Thus, you will simply sell more thanks to such things as translation-ready content and multi-currency site. To say more, advertising online is much easier than IRL. Plus, there are search engines that can be very helpful. Using online space for a shop, you make your business even more comfortable for the prospects and that’s how. Customers will always know, what items are available and what they should wait for. Moreover, your future customers will also see when the new arrivals are going to be. Devilery is another thing, which makes your shop a go-to place. Making is fast and free, you can be sure that the clients will want to back to your shop even when it’s online. Besides, people, in general, prefer buying things online. We live in a quite busy age, so not everyone has time on shopping. It saves one’s time. Your customers will be able to view out the products, select them and buy during work breaks and things like that. Needless to say, the possibility to view out rates, comments, and feedback is an important moment for any client. Plus, your shoppers will be happy to see various details and features of the products. 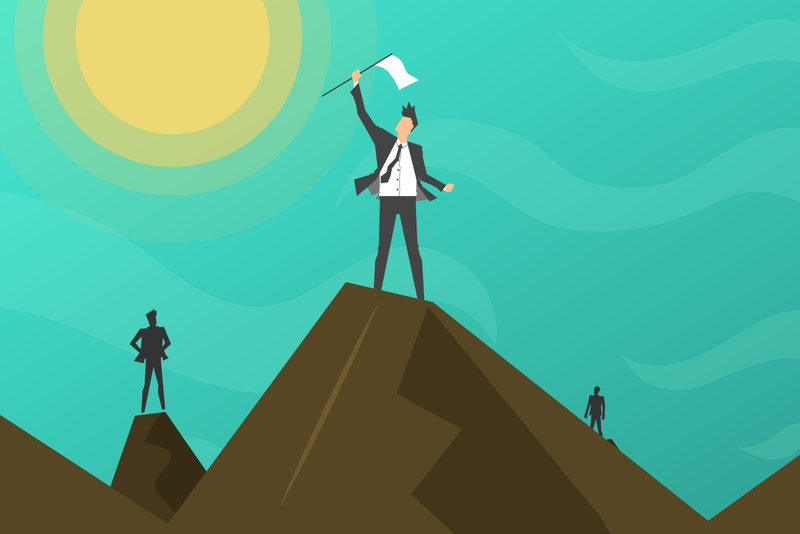 To finish with, you may want to take advantage of newsletter subscription, counters, banners, and other visual design elements. They will help you to inform people about the upcoming events like sales. And, as always, you may ask: but how to run a professional online shop? Fortunately, these days, you don’t have to take care of such things as coding. 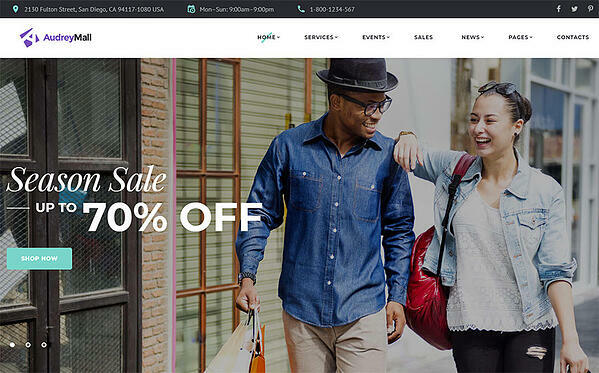 There are lots of fashionable website templates that can be used by people with any skill levels. Thanks to the handy packs these themes come with, you will be able to perform any changes without trouble. That’s how you can run a gorgeous website using modern technologies. There’s no coding required! 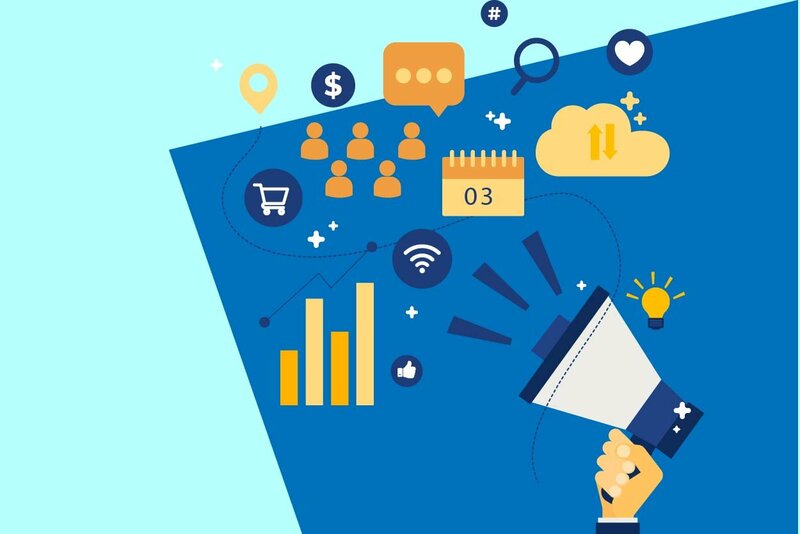 Firstly, you can catch the attention of the audience if your online project is SEO-friendly. With it, the website will be noticed by Google and its analogs. Secondly, many searchers work only with the native-speaking websites. So, in case you want to enlarge the audience of the online store, I recommend you to make the site multilingual. Thirdly, don’t forget that today over 50% of all the traffic relates to the small-screened devices. For these simple reasons, the website you work on should be fully responsive. You need it to look awesome and work great on any device. No doubt, there are tones of marvelous features, functions, and design components to improve the functionality of the website. I promise we’ll back to them pretty soon. And, before we get started, I would like to answer another popular question. So, we got used to this phrase: no coding skills needed! But what does it mean? Let’s see. Before everything else, today it’s possible to change the look of your online project without having special skills. 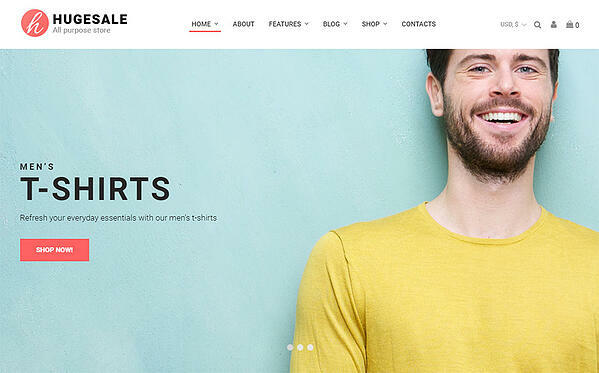 In this post, I’m going to introduce you 10 incredible wholesale templates for web stores. They make a nice example of how you can manage the website easily. How? It’s all about drag-and-drop, live preview, and WYSIWYG experience! Opening the packages of these products, you will see a fresh builder inside. It’s based on drag-and-drop functionality, which means that you can design the site by simply selecting the needed elements and dragging them to the editor. To say more, the packs already contain multiple trendy UI components, so you don’t have to look for them. On the other hand, there’s a live preview. It allows you to see what all the design details are going to look like. With it, you won’t make common mistakes. Without a doubt, ‘What You See Is What You Get’ technique is the best way to build a site. 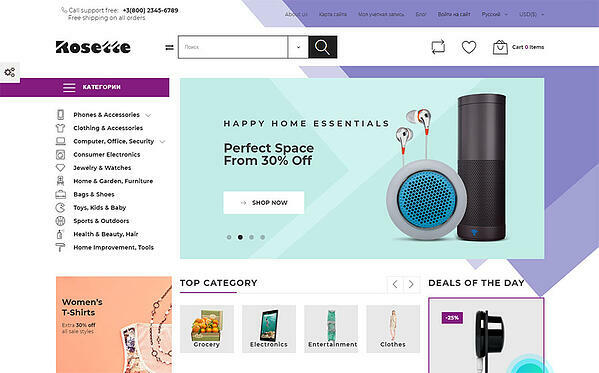 Now, as promised, let’s move to the other web design components you may want to use for the online shop of your dream. 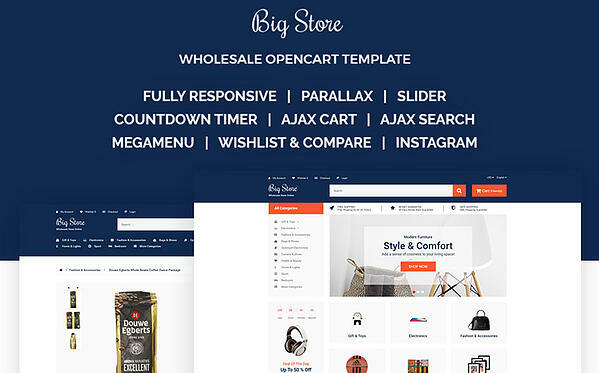 As an example, I selected 15 premium wholesale store templates. 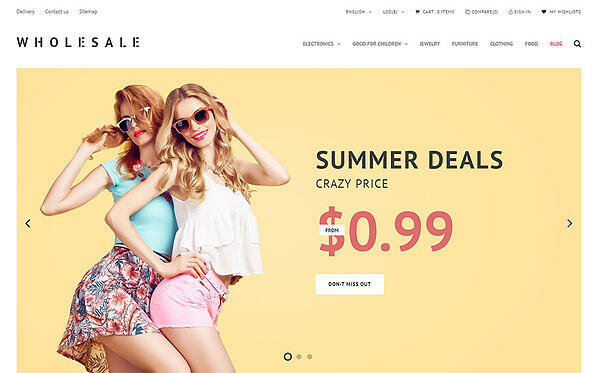 This product is a high-quality HTML-template, which was made for eCommerce projects creation. As you can see, Audrey Mall is a multipurpose template, which means that it fits multiple business niches. 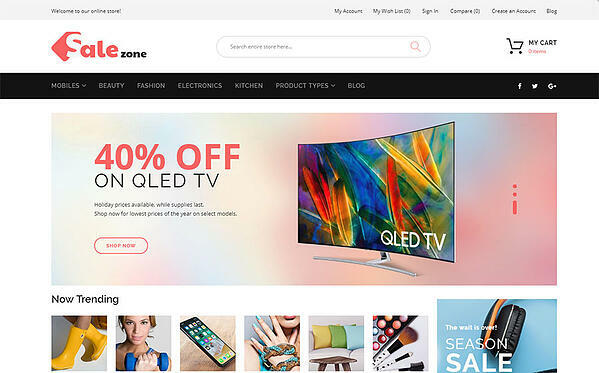 That’s why the owner of Audrey Mall gets many beautiful homepage variations and other pre-designed sections (35 ideally created ready-made pages!) but that’s not all! 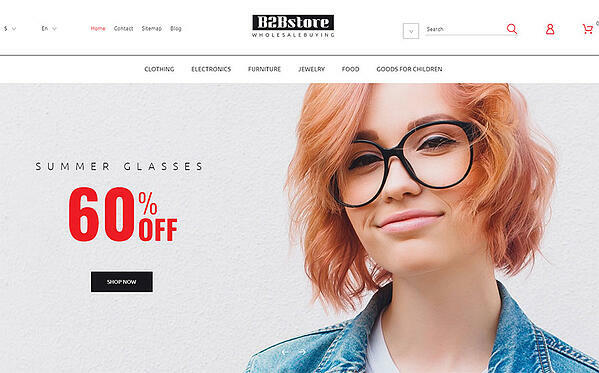 Choosing this wholesale store template, you get different styles for a gallery, blog, and other sections that make you closer to a shopper. For those who are looking for more niche templates, I want to advise you to look at WordPress restaurant themes. gallery grid, gallery masonry, and gallery cobbles. Before everything else, let’s talk about Parallax scrolling or Parallax effect. It’s an amazing web design trend, which has been popular for years. Such a rare feature for a trend, don’t you think so? So, that can Parallax bring to a website? Actually, the feature was made for video games but now it provides a fantastic look. With it, the website gets the effect of adorable 3D depth and motion when a visitor scrolls the pages. You can use Parallax to guide people through the content of the shop. 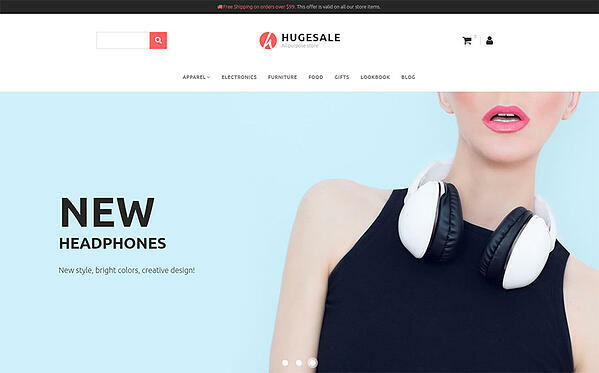 Next, we have Hugesale - another multipurpose online shop theme, made for WordPress based websites. 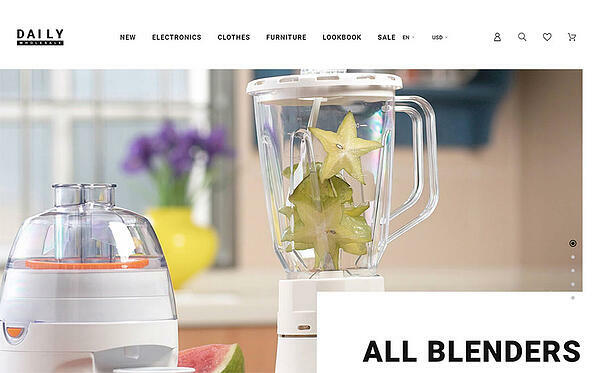 Today, all the products created for WP eCommerce are called WooCommerce same to a well-known store plugin. 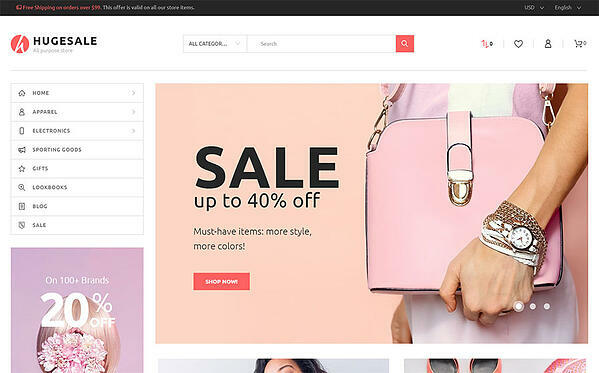 Therefore, working with Hugesale, you can be sure that the theme has everything and anything for eCommerce. You won’t need to buy something else! Back to the features, I was talking about, this item contains Elementor. It’s a famous drag-and-drop editor. The builder allows creating new pages without working with the code. the possibility to create your own layouts and save them as the new templates, etc. catalog image grid, and much more. Besides, opening the pack of this unusual eCommerce template, you’ll see AMP. What does it mean? AMP is for Accelerated Mobile Pages. It’s another web design trend, which fits any website. The thing is that AMP focuses on the way your webshop looks from mobiles. Still, it’s more than just a mobile-friendly design! To make a long story short, Accelerated Mobile Pages are meant to create small pages for the mobile version of the site. As a result, the project will be lightweight and lightning-fast! Here we have the next product for Magento 2 shops - Mobillaso. Among its functions, users will see Product Labels. They allow you to sort the goods by brands and also add small icons. As a result, you can highlight the new products or the things that are on sale. This small trick can catch the attention of your shop visitor without overloading the web design. Plus, there’s a Social Login option. It allows shoppers to enter the website using their social media accounts. Thus, people won’t need to waste time on registration. When it comes to SaleZone, there’s a feature that should certainly be highlighted. It’s called Mega Layout Builder. The feature allows you creating the additional place, where you can put custom content. 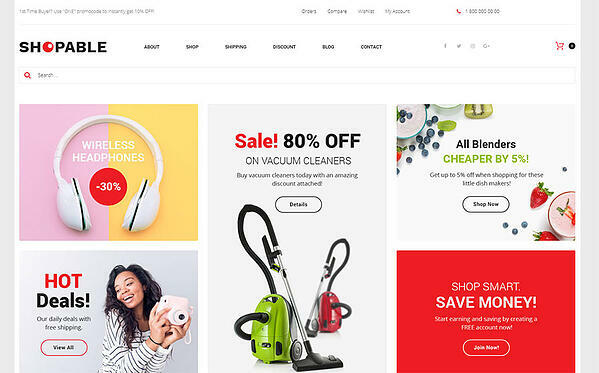 As a result, choosing this wholesale PrestaShop theme, you will be able to add extra content to your pages in any position and in any layout. It’s a magical tool especially if you already have the pages and simply want to add some updates. Also, the PrestaShop theme above is so easy to work with. All its components are flexible, just check by yourself! Needless to say, each category already has its ready-made set of pages. 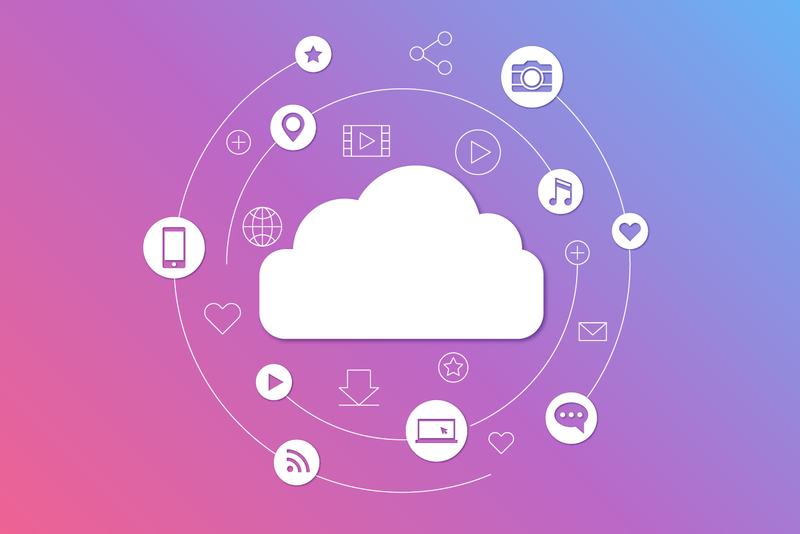 You can use them and simply upload your content. Or you can open the built-in editor and create your unique style. It’s up to you! So, what else should be inside your online shop? Without a doubt, it’s important to have a trustworthy relationship with customers. And it’s even more important when talking about sales! That’s why I recommend you to make sure that the online shop has such simple but working things like online chat and contact form. Using your chat, a shopper will be able to contact you directly. They can ask any questions regarding the goods you sell. As an alternative, you can add a quick contact form of both features at the same time. Remember I mentioned MegMenu plugin? It’s time to talk about it? What is MegaMenu and why do you need it to be a part of the website? First things first, MegaMenu is a quite popular plugin, which also became an old good web design trend. As the name of the feature says, the plugin was made to help you deal with the website menu. Initially, it allows creating menus of any complicity. With the help of MegaMenu, a user can literally build anything they want. You can add categories, images, banners, and subcategories. Moreover, using MegaMenu is great for SEO results, so remind this feature. related products options, and more. 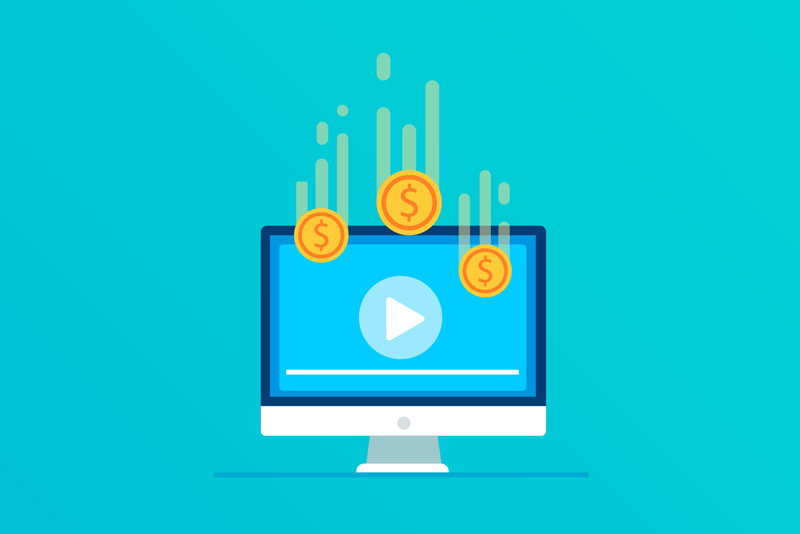 What is a live search and how it will help you to get more sales this season? Originally, live search is the search, which showcases the results when a visitor is just typing. With its help, people will definitely find the needed pages or items. 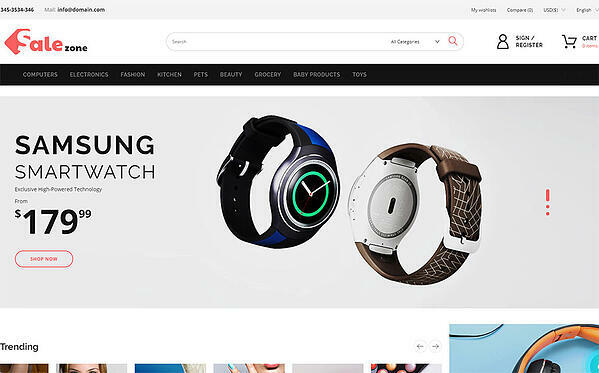 Furthermore, thanks to living search, a customer will also see which products are popular. That’s beneficial for you as well! To start with, I should mention that the next wholesale shop template from PrestaShop comes with 6 absolutely pre-designed layouts. Each of them contains a set of ready-made pages for an online shop. In addition, every page is totally responsive! Therefore, it looks amazing in any browser. The same thing is with the devices. TM Collections, and much more! 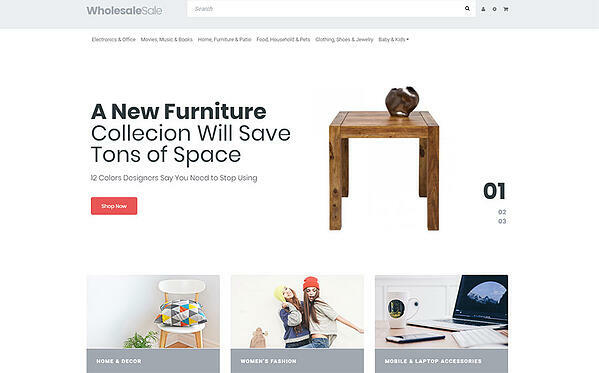 Here is one more worthy wholesale store theme for WordPress lovers! I already told you that any successful online project requires translated content. Fortunately, Shopable comes with multilingual and multi-currency content. Thanks to this option, a user can make their online shop available in different languages, with means it also will be available in different countries. On the other hand, there’s the multi-currency option. It transforms the prices of your goods automatically. As a result, using Shopable, you can quickly build a full-fledged international store to boost sales and expand the audience. Actually, this brilliant theme doesn’t require explanation. It also comes with all the must-have. And HugeSale contains lotta great trendy things in its pack as well. Just I recommend you to simply open its a demo. Check the way the template works in action! 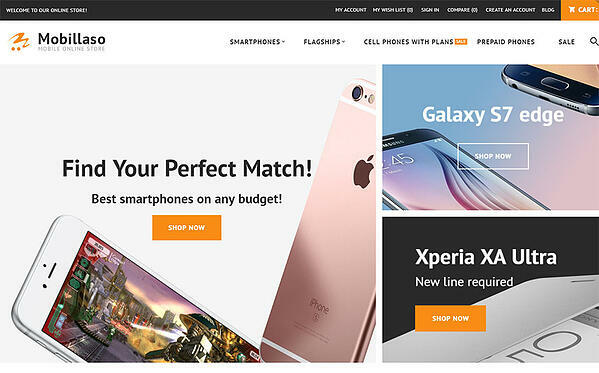 Now, let’s switch to the Moto CMS premium online shop themes! Basically, a free trial is what really great about the platform. Choosing one of their templates, you can download it for free, build the needed site, and use it for 2 weeks. It won’t take your money. You can even sell your goods during the period. I believe that’s a helpful and really fair feature. That’s how a user can figure out what exactly they are going to pay for. With it, you can see the way your online shop works, see the first results, try all the techniques and understand whether you want it or not. the theme is faster than light! Category Products to sort your items, and much more! For today, these were all the details a wanted to share with you. As you can see, the resources we have today allow people to build their sites without issues. Actually, today’s templates are really stunning. When used smartly, they are as awesome and unique as the websites that were designed personally for their owners by professional designers. Honestly speaking, nowadays, even many big players use these wholesale shop templates to build their eCommerce projects. So, what do you think? We outline the #1 reason B2B eCommerce site fail and how to avoid it.